As the University of Central Missouri kicks off its fall semester and celebrates its annual Get the Red Out game Thursday, Warrensburg residents have plenty to do this weekend. Adding to the excitement is the September First Fridays Art Walk downtown. This month’s Art Walk features 17 venues and more than 50 artist and musician participants, which organizer Jay Linhardt said is consistent with the initial Art Walk in May. With Get the Red Out and other events happening at UCM this weekend, Linhardt said he doesn’t really expect an increase in people yet. “There’s a new batch of people in town of course, so I actually believe it will take a month or two to get the word out to newcomers about the Art Walks,” he said. On the same note, he said any other event in town helps the Warrensburg Arts Collective and its projects because it’s the type of event visitors can skim through briefly before or after other events going on around town. Throughout summer, the transient college population made for a rollercoaster ride for the Art Walks as participants and venue owners have had other plans or obligations. With UCM back in session, it’s only a matter of time before student artists and musicians get involved. Members of the Arts Collective have had their work featured around town, outside of the Art Walks, including at the Farmer’s Market and in windows of businesses around town. The path of the Art Walk makes a “U” shape from Old Barney’s on Hout Street near the courthouse, south on North Holden Street, and then west on West Pine Street at Rudy’s Frame Shop. Maps are available at many of the venues along the route. 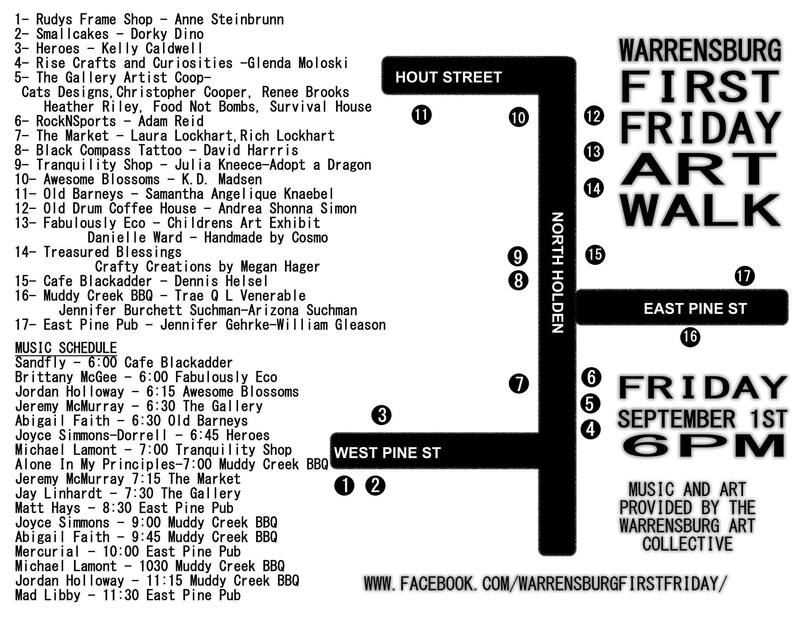 The event kicks off at 6 p.m. Friday, Sept. 1 in downtown Warrensburg. For more information, or for those who want to participate as an artist or volunteer, email the Warrensburg Arts Collective at warrensburgartscollective@gmail.com. For media inquiries, email Jay Linhardt at jayrocksthebay@gmail.com. Follow Warrensburg First Fridays Art Walk on Facebook here.